As sweet as cinnamon: Baseco Bag Progress/Pictures and a new BOM coming! Baseco Bag Progress/Pictures and a new BOM coming! who have purchsed the 'Baseco Mahal Kita' Tote pattern. 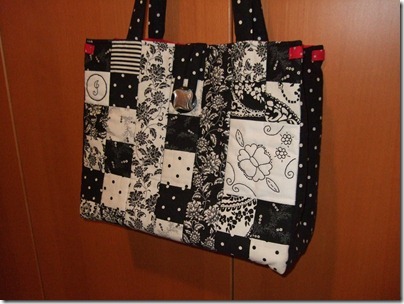 This is Dot's Bag in Wonderland fabrics. To take with you especially on sewing days. Whimsy by Fig Tree for Moda. with the gorgeous Mother of pearl button. It looks so crisp and chic Janice in black and white. for sending me a photo to use. Lots of beautiful versions of the Baseco bag. I love all of them, they all look fabulous. You can purchase a pattern from my sidebar. and we will sure to come and visit and have a look. Or send me a picture and I share some more soon. we, together have raised over $900. Those bags are great, Dawn! Amazing how a fabric choice can change the look so much. God bless you for doing such wonderful work! Love the look of your sneaky peek, girl, it's going to be fab, I know it! Gosh, there's my bag! I love the other versions. I hope lots of ladies show theirs. It is such fun seeing the different adaptations. Looking forward to next week's reveal. wOw! You have done a great job fund raising with your pattern!! 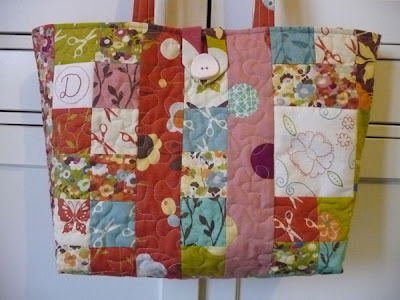 love seeing what others did with your bag pattern........and the new bom looks very intriging!! Wow all those bags are just amazing and I love all the colours. It is wonderful how well you have done in raising money. Also congrats to you all who bought a pattern (including me here) for helping Dawn raise the $$$. Oh wow! $900! I'm so happy to see that. I can't believe I still haven't gotten my Baseco Bag made yet! The pattern seems to have gotten buried on my sewing table! But I do know which pile it's in...I think! LOL Looking forward to your new BOM! 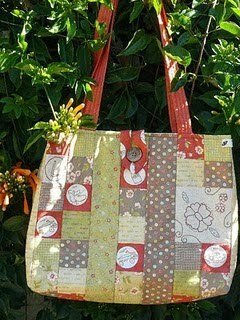 Look at all those bags made from your lovely pattern. hey are amazing. It's no surprise you have raised so much money. I will make mine, I will, I will, I will...haha! Love the bag pattern. You can make so many different looks depending on the line of fabric used. A big well done to all those who have made bags. They are all delightful. Looking foreward to seeing more of the BOM. Just goes to show, one person CAN make a difference! You must feel like a mummy hen watching her birdies fly!!!??? Well done, Dawn.....you're an angel!...those bags look spectacular. Just finished my bag yesterday and I have to say it came together very quickly.I already have it earmarked for a couple of presents on my to-do list. Thanks for sharing such a lovely pattern and in the process let me help those less fortunate than me :) Barb.